Everyone has had that moment--we see a need in our church, our school, our neighborhood, our family, or our world and we think, Someone really should get to work on that, never imagining that we might be the answer to that need. We don't have the time, the expertise, the money. We've got careers to manage, bills to pay, meals to prepare, and families to attend to. Besides, who are we to think we can change the world? 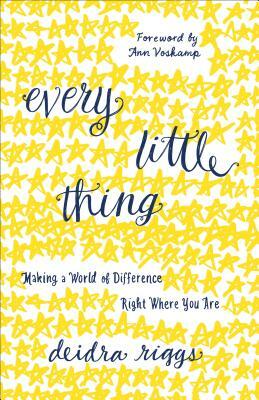 In this encouraging and empowering book, Deidra Riggs calls readers to accept God's invitation to join him in making a difference right where they are, regardless of their current life stage. She shows readers that they were created with a purpose and with the capacities to fulfill that purpose. And she reminds them that it's not up to us to fix the world, but it is up to us to join God--and the rest of his people--in his redemptive work. For when God calls and we look over our shoulder and answer, "Who, me?" God always emphatically answers, "Yes, you.